Pure Ponzi for the Win! 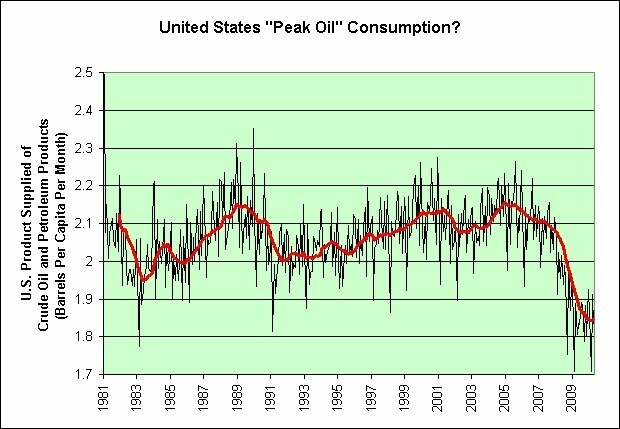 United States "Peak Oil" Consumption? Is Gold a Safe Store of Value? In any case, Taleb doesn't offer any novel advice to investors who fear a government-debt crisis. He recommends keeping cash in short-term Treasury bills. If government debt is "pure ponzi" but he still recommends government debt, then everything else must be pure ponzi too! I'm not sure it is the safe haven he thinks it is though. Note the 1970s in the following chart. And yet, what are you going to do if the pain continues? Pick your favorite ponzi poison? So where exactly is the value? I'd say canned goods and toilet paper, but there's only so much we can buy. That said, when all investments seem expensive, perhaps cash isn't all that bad. Perhaps that's why I'm still deflationary. Put another way, if everyone felt cash was the place to be, then perhaps all the other options would be cheap. Herding behavior is not your friend in a welfare state it would seem. I have a problem with the math. A child is in class just one year and we would like to route all his/her extra lifetime career gains directly to the teacher? Why would we want to do that? Shouldn't we be letting the child keep at least some of those gains? Let's say the child works 30 years for the child and the teacher worked 1 year for that child. Maybe the outstanding teacher should therefore be getting about 3% of $320,000 and the child should be getting the other 97%. Perhaps the standout teacher therefore deserves an extra $10,000. Wouldn't that seem a bit more fair? Let's say someone does a study to show how much more money you can earn if you go to college over the amount of money you can earn in a lifetime if you don't go. The colleges then set the amount of tuition to be that exact amount. Based on the rise in tuition costs, I'd say they are certainly trying! If they ultimately succeed, would it still be useful to spend 4 years in college and take on a lifetime's worth of debt? Let's say a study shows that buying a child an entire encyclopedia set at an early age would increase the lifetime earnings of that child by $100,000? Would it then seem rational if encyclopedia set prices were set at $100,000? Or should we just let the free markets decide what encyclopedia sets should cost? I'm not trying to argue that outstanding teachers aren't worth a great deal to society. If I had my way I'd certainly pay them more than many in the financial services industry. I clearly don't have what it takes to be a prize winning economist though. I think "The Case for $320,000 Kindergarten Teachers" is a bit ridiculous. Who is Guy Hands? His story brings a tear to my eye. The accounts, which have just been filed at Companies House, show that the couple have risked millions of pounds of their own money in loans to shore up the company. In Guernsey, an island of 66,000 people, Hands doesn’t pay any capital-gains levy and only a 20 percent income tax; most businesses pay a maximum of 20 percent. Imagine that your income and capital-gains are so high that you are forced into tax exile. That is just so sad. I'm really starting to tear up here. That love of money just breaks my heart. Where could he have learned such a thing? May he find all he deserves and more in China. This chart has a lot to say so let's dive right in. 1. 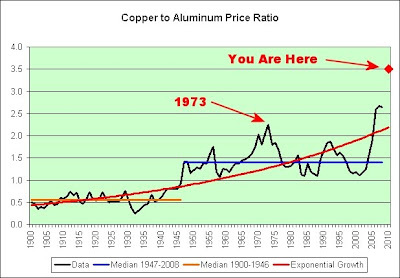 The price of copper compared to the price of aluminum either grows over time (as seen in the exponential growth line) OR there was a one time jump at the end of World War II (as seen in the two median lines). 2. 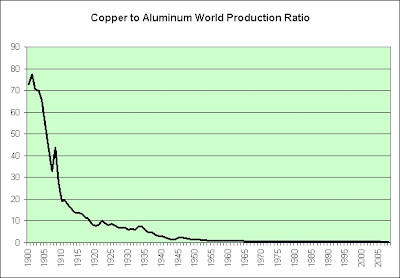 Either way, the price of copper currently seems very expensive compared to the price of aluminum. 3. 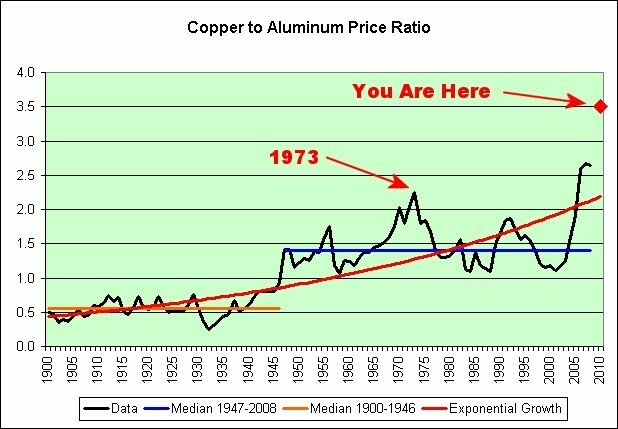 In 1973, had you known stagflation would appear then you would have been far better off hoarding aluminum than copper, even though aluminum is the most abundant metal in the Earth's crust. Here's another chart to think about. Aluminum is a recent discovery. It does not have the 5,000+ years of history that copper has. That said, aluminum is clearly very important to us. 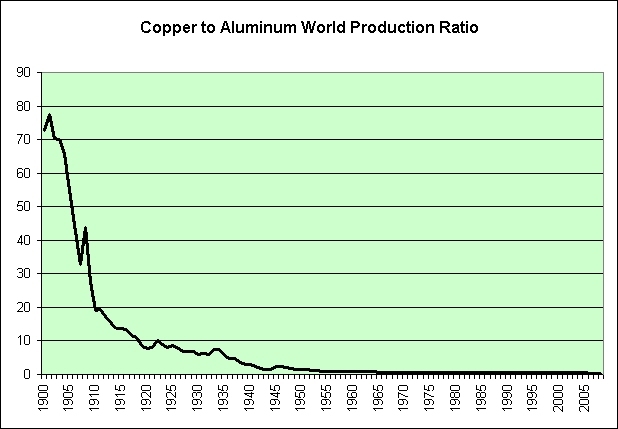 The world now produces roughly 10 pounds of aluminum for every 4 pounds of copper. The Model T was introduced on October 1, 1908. A new study by Ducker Worldwide, commissioned by The Aluminum Association, Inc., confirms that in North America the use of automotive aluminum is at an all-time high, averaging 8.6 percent of vehicle curb weight in 2009 calendar year vehicles, up from just 2 percent in 1970 and 5.1 percent in 1990. Additionally, the integration of aluminum in cars and light trucks is projected to be nearly 11 percent of curb weight by 2020. Boeing engineers, Mr. McNerney says, are also studying whether they will build a new plane out of the traditional aluminum or use composite material like the type used on the new 787 Dreamliner. "I don't think we know yet if [any new plane] will be predominately aluminum or composite," he says. "Certainly, we'll use more composite and titanium components on whatever we build in the future." Nothing is ever easy. 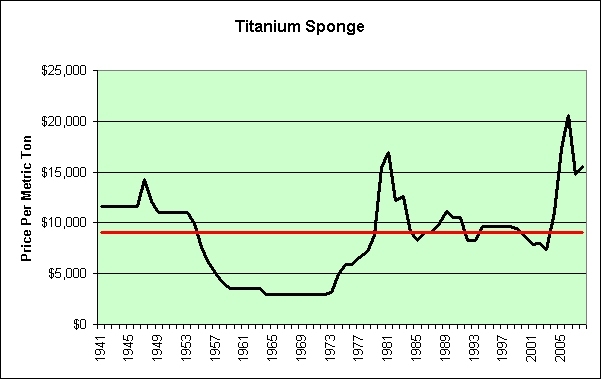 Perhaps titanium is a safe store of value? You will note that it is not adjusted for inflation. 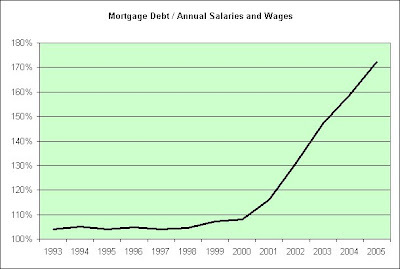 The red trend line is the median price over the period. Buried cash performed similarly. 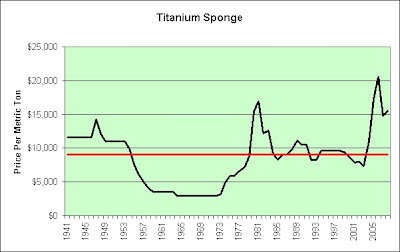 Titanium sponge is a porous form of titanium that is created during the first stage of processing. In its natural form, titanium is widely available within the earth’s crust. Get in now or forever be priced out! Again! The earth isn't making any more titanium! Why do I suddenly sound like a chief economist at the NAR? 1970s stagflation here we come!! Lobb says it's not a matter of simply raising more chickens. The nation's chicken producers turned out 9 billion birds in 2009, he says. Other than for wings, the recession has slowed demand, and the overall price for chicken has been soft. "As expensive as wings are, they cannot carry the entire bird," he says. It's a company that has high exposure to the chicken wing market, and in a time when most proteins are much higher versus last year in terms of price, chicken wings have declined from an all-time high in January to below a normal level. The industry has been working through a bout of weak pricing brought on by oversupply. 1930s deflation here we come!! Yes, we clearly need more chickens. 9 billion birds is not nearly enough. That's only 30 birds per man, woman, and child in the United States. Oh the humanity! Have I mentioned my theory that I thought we were trying to combine the very best of the deflationary Great Depression with the very best of the inflationary 1970s? Chicken wings for the win! As a side note, I'm still not bullish on our restaurant industry. I don't think two wrongs will make a right. Gold is always considered a safe investment during economic uncertainty and moves inversely with the dollar. It is? It does? Note the word "considered". What's it doing there? Why not just say that gold is always a safe investment and that it always moves inversely with the dollar? Could it have something to do with the early 1980s? Investors were extremely uncertain then. They drove gold's price up to bubble levels. For the next 20 years gold turned out to be a lousy investment though. 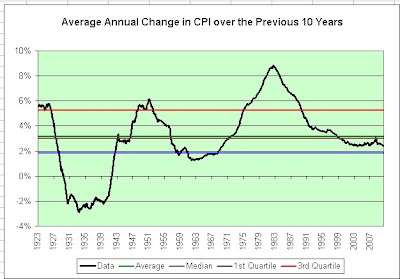 Not only did its price not rise in inflation adjusted terms, it didn't even rise in nominal terms. Your home will continue to be one of your best investments this year, if the latest forecast from the National Association of Realtors is correct. "At the same time, some buyers who have believed hype about a housing bubble are hoping housing prices drop, but that's not happening either." "The market is much better than you might hear or read," Steven says. "Consumers should take advantage of this perfect alignment of low rates and extraordinary inventory before market conditions change." Today’s release on manufacturing activity by the Richmond Fed is pretty ghastly, as you would expect given that the effects of fiscal stimulus are now wearing off at accelerating pace – before the happy handover to the private sector is safely consummated – and given that the structural East-West imbalances that lay behind the global crisis are getting worse again. There's another famous Ambrose of course. Economy: Purchasing the barrel of whiskey that you do not need for the price of the cow that you cannot afford. Finance: The art or science of managing revenues and resources for the best advantage of the manager. The pronunciation of this word with the i long and the accent on the first syllable is one of America's most precious discoveries and possessions. Land: A part of the earth's surface, considered as property. The theory that land is property subject to private ownership and control is the foundation of modern society, and is eminently worthy of the superstructure. Carried to its logical conclusion, it means that some have the right to prevent others from living; for the right to own implies the right exclusively to occupy; and in fact laws of trespass are enacted wherever property in land is recognized. It follows that if the whole area of terra firma is owned by A, B and C, there will be no place for D, E, F and G to be born, or, born as trespassers, to exist. Mammon: The god of the world's leading religion. The chief temple is in the holy city of New York. Millennium: The period of a thousand years when the lid is to be screwed down, with all reformers on the under side. Owe: To have (and to hold) a debt. The word formerly signified not indebtedness, but possession; it meant "own," and in the minds of debtors there is still a good deal of confusion between assets and liabilities. Railroad: The chief of many mechanical devices enabling us to get away from where we are to where we are no better off. For this purpose the railroad is held in highest favor by the optimist, for it permits him to make the transit with great expedition. Tariff: A scale of taxes on imports, designed to protect the domestic producer against the greed of his consumer. Wall Street: A symbol for sin for every devil to rebuke. That Wall Street is a den of thieves is a belief that serves every unsuccessful thief in place of a hope in Heaven. Even the great and good Andrew Carnegie has made his profession of faith in the matter. 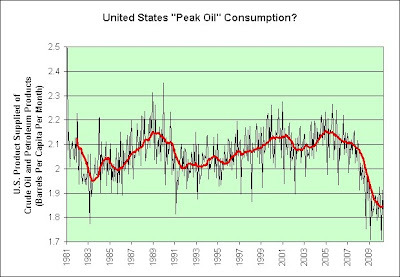 The following chart shows the amount of oil we use in the USA per person per month from January 1981 to April 2010. I have included a 12 month moving average as the trend line. "Peak oil drives prices up in the first place. It has its own mechanism. We're sort of at peak demand right now," Campbell told Reuters from his home in the village of Ballydehob, West Cork. "I think presently the price limit is about $100." For what it is worth, I similarly shifted my mindset back in November. I'm not embracing the stagflation story all that much these days. 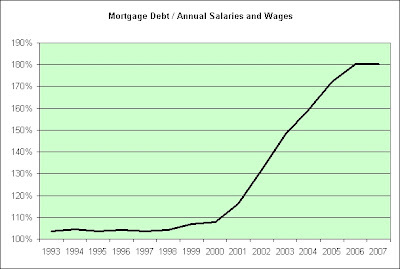 I do think the stagnation story is alive and well though. The WTI spot price was $79.44 that day. We're trading slightly below that level right now. In my opinion, the ride up is probably about over. I have added a 2nd order polynomial trend line in the spirit of previous stimulus physics thoughts. I would argue that the price of oil has certainly been stimulated. The trend line shows one possible outcome out of many. 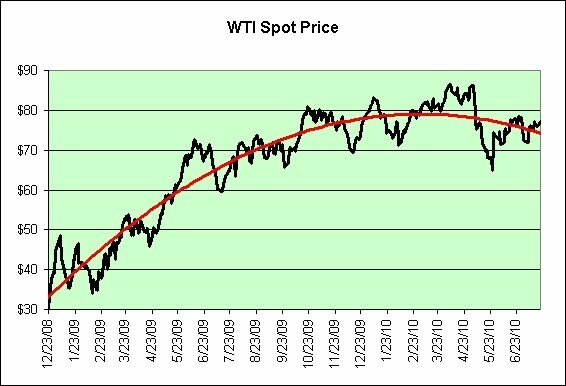 I'm certainly not trying to predict the future price of oil based on a trend line. 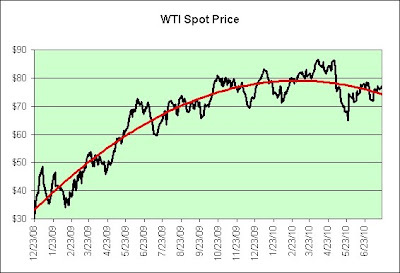 Even if I am right to think the price of oil is high, it could simply trend sideways for many years. Knowing the future price of oil would certainly help out my investment decisions. If the price of oil was to crash from these levels (again), then it would have far reaching consequences for all those who felt hoarding commodities was a great wealth protection strategy. Take this person for instance. He doesn't even mention the power of modern mining equipment in his analysis. In 2008, the world produced 15,400,000 metric tons of copper. That's 5 pounds of copper produced in just one year for every man, woman, and child on this planet. The United States consumed 2,220,000 metric tons in 1966. It consumed just 2,020,000 metric tons in 2008. Copper is part of the Chinese economic miracle story. In order to invest at these prices, you better believe in the miracle. I do not. I share my disbelief with Jim Chanos, the investor who built a large fortune by betting against Enron. If you count them, then you might be tempted to count on them. One single statistic completely undermines that idea that the Chinese consumer will lift the global economy: The proportion of the China's GDP contributed by the household sector (wages, salaries and consumption) peaked at 56% in 1983 and has since dropped to 36% -- roughly half the size of the consumer economy in the U.S.
Once again, I'm not a believer in the Chinese economic miracle story. It's just an opinion of course. Investment, including foreign direct investment, accounts for 44% of China's economy, a higher level than Japan or South Korea ever reached in their modernization drives. Even more startling, much of this investment is borrowed. China's mostly state-controlled banking system made loans last year that were worth one-third of the nation's economic output, and this year, it's on track to hit 20% of GDP -- a total of roughly $2.5 trillion in new credit over two years. I saw that headline and looked at the chart within it. There is more to the story though. Here's the data going back even further in time. 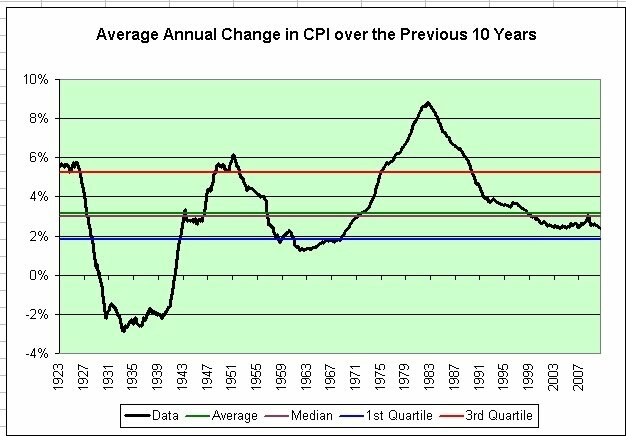 On the one hand, we haven't seen the 10-Year average inflation rate this low in 40 years. It could be argued that this is a black swan event. On the other hand, we're actually not that far away from the average values and median values. It could be argued that there is nothing at all special about this era. We aren't even in the lowest quartile. If this was a test graded on the curve, we'd probably get a C-. That would hardly make it a black swan event, at least not yet. I tend to think it is the latter situation. I remain deflationary. I think getting into the lowest quartile is still a distinct possibility. The Fed is certainly fighting deflation (or should I say postponing it? ), but that just tells me where inflation naturally wants to go. That direction is down. I was offered the following link by dearieme in the comments. I haven't read it all yet but what I have read is certainly interesting. Commodity investment should be especially shunned. Commodities as a general asset class offer a long-run return no better than zero % after inflation and less after fees. The cost of holding commodity positions is bedevilled by the herding of portfolio investors all seeking to roll over their futures positions at quarterly expiry dates. Commodity indices that act as the benchmark for performance can also be gamed by the investment banks that maintain them. The flood of portfolio investment going into commodities in the past few years has turned their hitherto negative correlation with equities into a high and positive correlation. This goes right along with what I have been saying. If you hoard commodities with the intent to resell (and not just use yourself), then you will also need to pay taxes on the inflationary gains. That would push your return down even further. One of the following therefore better be true. 1. You better be buying commodities at a steep discount. 2. It is "different this time" AND it is different in way that is actually helpful to long-term commodity prices. A Great Depression would clearly not count. If nothing else, those are great section headings! I'm probably especially biased on the second one though. The illusion of prosperity ends in disillusionment. A feeling that arises from the discovery that something is not what it was anticipated to be, commonly held to be stronger than disappointment especially when a belief central to one’s identity is shown to be false. New York has Wall Street. This provision, intended to mine what the IRS deems a vast reservoir of uncollected income tax, was included in the health care legislation ostensibly as a way to pay for it. The tax code tweak is expected to raise $17 billion over the next 10 years, according to the Joint Committee on Taxation. 1. Let's assume gold bought today exactly keeps up with inflation long-term. 2. Let's assume you are taxed at 28% on all those inflationary gains. 3. Therefore, plan to lose up to 28% of your purchasing power over the long-term. The only way it makes sense to hold gold is if you think it can rise much faster than inflation overall. Gold averaged $285.73 in June 2000. Gold averaged $1232.92 in June 2010. That's a 15.7% average annual return. 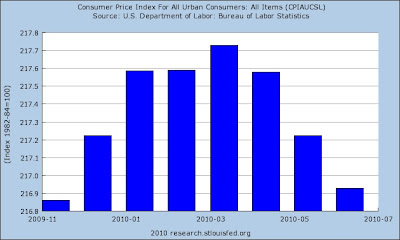 The CPI-U was 172.400 in June 2000. The CPI-U was 217.965 in June 2010. That's a 2.4% average annual inflation rate. Gold has outperformed the typical "safe store of value" by roughly 13.3% per year for the last decade, but I'm told greed and leverage have nothing to do with it. This investment is speculative, therefore the above projected prices and returns are based on stated price levels, and should not be understood as guaranteed future prices that will definitely be attained. By making a 20%* down payment of $9,000 and financing the balance**, the cost per bar is only $1,800 (plus fees and commissions) and the investor has five bars of gold in his account instead of one. This article contains weasel words, vague phrasing that often accompanies biased or unverifiable information. Gold is also money, although it is treated by some investors as a commodity. Gold is not money. Money is any object that is generally accepted as payment for goods and services and repayment of debts in a given country or socio-economic context. I cannot pay my debts with gold bars, any more than I could pay my debts with aluminum cans. I could sell either in exchange for money and then use that money to pay my bills though. Gold is a commodity. This really isn't open for debate. A commodity is a good for which there is demand, but which is supplied without qualitative differentiation across a market. It is fungible, i.e. the same no matter who produces it. Bullish investors may choose to leverage their position by borrowing money against their existing assets and then purchasing gold on account with the loaned funds. There's no mention of what bearish investors may choose. Leverage or derivatives may increase investment gains but also increases the corresponding risk of capital loss if/when the trend reverses. What's up with the "if/when"? Is this the one trend that may never reverse? Leveraged investments that always gain? Wouldn't that be a first. We need more CEOs and boards to follow their examples. Only when that happens can we be certain that the values that have led to short-term economic bubbles have really changed for the better. GE's expansion will come primarily from the nonphysical world. That is, the company will extend its already massive financial services business with more products for consumer and commercial customers. Chief Executive Jeffrey Imelt has not ruled out the subprime consumer lending business either. GE could expand its television efforts beyond NBC, which currently adds $7 billion to GE's top line, and its cable properties Telemundo and the Bravo network. With the U.S. government pushing to boost its defense budget, GE's heavy industrial business--which makes jet engines and other equipment--could get a big boost. For General Electric, the purchase of First National expands its reach into familiar territory at a time when concerns about consumer credit in Britain are reaching a fever pitch. Most analysts now acknowledge that the housing market is experiencing a bubble fueled by very low interest rates, and consumers have gone on spending prolifically even as the overall economy has begun to slow. GE said it will take a third-quarter charge of $300 million to $400 million to exit the subprime market. Even if the products debut as planned, Immelt needs them to become hits quickly. They will make up a larger share of earnings because the percentage contributed by other businesses is decreasing as GE sells a majority stake in its NBC Universal unit to Comcast Corp. and shrinks GE Capital to less than a third of profit from about half in 2007. Immelt says: "I had one good day as CEO—September 10, 2001—before the roof caved in." Yes, indeed. He's not joking either. September 10th was a Monday. He became GE's CEO on the previous Friday. Immelt looked backward and pretty much saw what I am seeing. GE's stock price on September 10, 2001 was $39.35. It now trades at $14.94. Not counting dividends, that's a 62% loss. Consider Immelt’s General Electric. The conglomerate’s massive financing business, GE Capital, had relied on short-term borrowing in the credit markets for most of its funding—a business model that left it highly vulnerable in the fall of 2008. The Federal Reserve rode to the rescue by guaranteeing the vast commercial paper market, in which GE Capital was a significant participant. Then the Federal Deposit Insurance Corporation said it would guarantee debt issued by financial institutions, a new entitlement that GE embraced wholeheartedly. Today, GE Capital has $59 billion in such guaranteed debt outstanding (about one fifth of the total program as of May 31). Yes, GE Capital is simply using a program made available to many companies, large and small, and it has paid more than $2 billion in fees. But the company is receiving a huge subsidy courtesy of the taxpayers. Yes sir. We clearly need more "forward-thinking" CEOs and boards to follow GE's example. That part where we the taxpayers subsidize GE's risky behavior? Genius! I find it very disturbing that anyone could think we've spent the last ten years producing the illusion of prosperity. That's the craziest thing I've ever heard. It is simply preposterous. It makes me wonder why I even have him on my preferred blog list as seen over on the left side of my blog. First, "the" illusion? That implies there is only one. That's just crazy talk. Just one smoke? Just one mirror? Seems very unlikely. We've had a plethora of smoke and mirrors lately. There's more illusions than a funhouse! Why not Illusions of Prosperity? It is silly to limit to just one. Second, 10 years? Who is buying that theory? It took the Roman Empire an estimated 320 years. What are the odds we're just 10 years into it? I could go with 40 years though. That's when we fell off the gold standard. That was quite a shock. I could also go with 20-30 years. That's when we started embracing the concept of an ever increasing trade deficit on a biblical scale. 10 years though? What's he smoking? Crack? Perhaps I'm being too harsh though. I do find some merit in his illusion of prosperity theory in general. From a completely unbiased perspective I assure you, something just feels right about it. I can't quite put my finger on it though. I see Economic Disconnect's Another Mixed Bag as it relates to Yahoo headlines and raise him an Illusion of Prosperity's take on Bloomberg headlines! It is funny. I was just telling my girlfriend last night that the following headlines were just so darned silly when taken as a group. Readers may know that I think gold is expensive and I do not trust it as a safe store of value at these levels. However, I cannot generally endorse Bloomberg's headline logic as seen below. July 19 (Bloomberg) -- Gold may drop, extending the biggest fall in almost two weeks, as the dollar gains, curbing demand for the metal as a store of value. Aha! Gold priced in dollars may fall as the dollar advances! The dollar slid to a nine-week low against the euro after reports yesterday showed U.S. manufacturing contracted in June by the most in a year and producer prices fell. U.S. reports may today show household sentiment deteriorated and consumer prices fell. Gold priced in euros today slipped to an eight-week low. Aha! Gold priced in dollars may fall as the dollar slides! I know what you might be thinking. That last link says "priced in euros". That is true. I would remind you to read the headline again though. It says "Gold may fall in New York". That's dollars. All prices quoted within the article are also in dollars. So let's sum up the two headlines. Nope. Not quite there yet. If gold may fall then we can't rule out that it might also rise. Further, I'm pretty much told here that the dollar's movement is irrelevant. We should therefore remove that part. Here's a better headline. Okay, now let's trim it down to its most concise form. There's really no need to point out that it might rise or fall. Most people can figure that out on their own. We should remove that part. Fantastic headline! I'm very pleased with myself on this one. Print it! We're done! All the sensationalism is gone now. There's no added fluff and all the action verbs have been stripped. It's a very good article from one of my favorite columnists. Dumping hundreds of billions of yuan into illiquid, mostly luxury dwellings is a catastrophic misallocation of capital in a country with an average per capita income of $3,000 per year. But that gross misallocation of capital is only part of the problem: since the vast overhang of luxury flats is illiquid and cannot be sold, these "investment properties as savings" are a black-hole capital trap: the invested capital cannot be turned back into cash. Once the cash has been dumped into the black hole of illiquid real estate, it cannot escape; as with physical black holes in space, there is an event horizon beyond which the capital cannot be recovered. In China's real estate market, that is the moment when the buyer's funds are transferred to the developer. This trapping of China's vast private capital in illiquid, rapidly depreciating investment properties will have far-reaching negative consequences going forward. When the time comes to transfer their "savings" back into cash, owners will find that their flats are worthless due to deterioration and/or the inability to find a buyer at any price. All these luxury flats are speculative; many are empty and will never be inhabited. When the citizenry finally understand that the Central Government cannot stop prices from falling, or provide a deep, liquid market for re-sales, then panic will take hold, just as it does in the collapse of every bubble. Unfortunately, investors in China will discover too late that luxury flats are not equivalent to cash in savings accounts, for the money only flows one way near a black hole: over the event horizon and into an inescapable capital trap. The following was what Chanos said on May 18, 2010. Q: How to Short China? A: Obvious is the land development companies and I'll let you figure out which ones. But we also short the derivative plays. 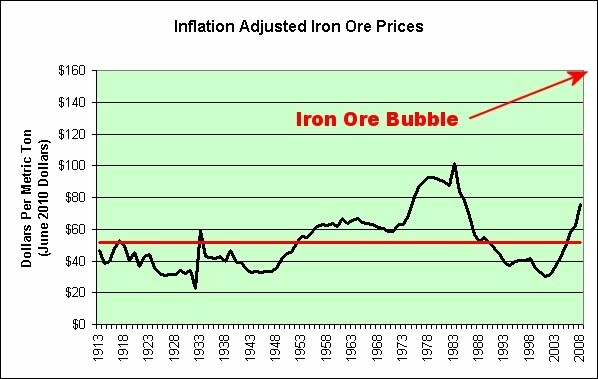 There was a dramatic increase in commodities, specifically in Iron Ore, in 2005. It went from $30-$40 up to $160. I expect that it will mean revert when China stops building. 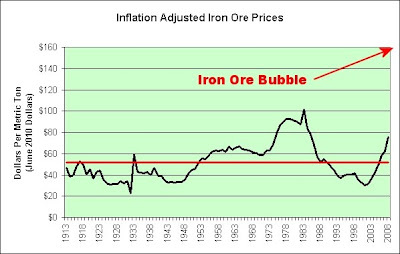 I offer a chart showing where the inflation adjusted mean is on nearly a century's worth of iron ore prices. Investors searching for signs of a double-dip recession could do worse than look at iron ore. Prices have tumbled by more than a third in three months, as Chinese steelmakers have scaled down production. Steel Market Intelligence, a market research company, said the Chinese steel industry had brought its troubles upon itself by “producing high-cost steel at a breakneck pace”. “We are stunned by the lack of financial good sense by China’s high-cost steelmakers who continue to turn gold into straw,” it says. I remain deflationary. I continue to be extremely bearish on China's unsustainable economic "miracle" story, just as I was back in 2007 heading into their stock market collapse. I also have no desire to hoard any rocks right now, shiny or otherwise. Where Are Global Managers Investing? You've got 660 million tons of cement manufacturing capacity; that's more than the EU, the US, Japan, and Russia combined; and they've got 470 million tons under construction. I love it when numbers line up that well. Cement? Steel? Under construction? Demand? It's all good. Just mix and match numbers and economic phrases and you too can be a global manager! China produced an estimated 1.45 billion tons of cement last year, accounting for half of world output and making it more than eight times bigger than its nearest rival India, according to the U.S. Geological Survey. Producing "1.45 billion tons of cement" with just "660 million tons of cement manufacturing capacity" is truly miraculous. China never ceases to amaze me. Here's the seasonally adjusted CPI over the last 8 months. Here's the seasonally adjusted musical tribute over the next 8 hours. Enjoy! The survey's preliminary July reading on the overall index on consumer sentiment plummeted to 66.5 from 76.0 in June. The figure was below the median forecast of 74.5 among economists polled by Reuters. "Income and job prospects were extraordinarily weak and those bleak prospects have made consumers much more cautious spenders," Richard Curtin, director of the surveys, said in a statement. The tests were often "stressful and demotivating" for pupils, particularly for lower achievers, while "narrowly focused" testing did not take account of the social and cultural backgrounds of pupils, the unions said. An Alternative Theory for Japan's Deflation: Robots! For over 100,000 years, humans have competed with humans for work. The world's population has doubled in the last 42 years. The growth rate in humans has nothing on the growth rate in robots though. This is especially true in Japan. The above chart shows Japan in a commanding lead with 295 industrial robots per 10,000 manufacturing workers. In Fact, there are now 1 million industrial robots toiling around the world, and Japan is where they’re the thickest on the ground. Why Japan's aging, shrinking population is bad for the United States. Not only is the Japanese population aging, it's also shrinking, from 127 million today to a projected 89 million by 2055, the result of a plunging fertility rate. This unfortunate combination is causing the country to lose its edge and dynamism. Older workers are less innovative; older, more "mature" markets attract less investment. Older populations live off savings, rather than generating new capital. And, as the number of working-age citizens diminishes, pension funds will be exhausted and tax revenues and government budgets will be squeezed. SAN FRANCISCO (MarketWatch) -- Japan's unemployment rate rose in May to a seasonally adjusted 5.2%, according to government data released Tuesday, marking an increase from 5.1% in April and confounding expectations for a drop in the jobless rate. I expect a bull market in "confounding expectations" well into the distant future. If Japan's unemployment can actually rise even as their population shrinks then one can only imagine what the rest of the world's employment outlook is. Picture the average robot. It can work 24 hours a day, 7 days a week. It never takes a vacation. It never complains. We're competing with them just like we're competing with Chinese factory workers. Chinese factory workers do complain though, not that it will do much good. June 22 (Bloomberg) -- New minimum wage laws, a looser yuan and worker strikes like those affecting Honda Motor Co. and Toyota Motor Corp. are raising costs at plants in China’s Pearl River Delta, leading to increased automation of assembly lines. Foxconn Technology Group, Nissan Motor Co.’s Chinese venture and VTech Holdings Ltd. said they are investing in factory equipment to reduce their reliance on labor. Wages in the region called the world’s factory floor increased 17 percent in the past six months, according to a survey by the government- backed Hong Kong Trade Development Council. I've been talking about this since I started my blog back in 2007. Here's the link to that claim. The reasons behind this imbalance aren't hard to find. Mainstream economists have long noted that automation and offshoring have resulted in massive job losses for the less educated, while government workers and the highly educated have secured high-paying employment that's largely protected from the effects of globalization. It isn't just weak growth that's damping job growth. "Companies, in the name of making money, substitute against labor through outsourcing or technology," said Allen Sinai of Decision Economics. Wages and benefits make workers "so expensive that who wants to hire them? As a result, the displaced workers won't be rehired unless we have double the growth rate we're expecting." The following link contains a must-see chart. Economist's View: How Bad is the Job Situation? There's also a video offered by Goldilocksisableachblonde within the comments that is a must-see. I have embedded it below. It is a short video with a few animated graphs that should make your jaw drop. One reason I turned bearish was because real wages peaked in the 1970s and I was not optimistic about real wages heading into the future. I still believe that, now more than ever. SAN FRANCISCO (AP) -- Intel Corp. has booked its largest quarterly net income in a decade as the chipmaker benefits from a stronger computer market and more sophisticated factories. Did someone just say more sophisticated factories? And who do you think checks the accuracy of the welds? Other robots. It's a high-tech robot job creation program. That's exactly what we needed. The last time Intel's quarterly net income topped $2.5 billion was in 2000 during the dot-com heyday, when Internet fever fueled spectacular computer sales. We've replaced that Internet fever with robot fever. Prosperity here we come! We can sit at home and play video games while the robots do all the work for us. Fantastic! As a side note, China's 1.3 billion workers will also be able to sit at home and play video games each and every day with us. Win win! Can I assume that unemployment benefits will be extended permanently? Can I also assume that non-farm payrolls will change to represent the future economy? Perhaps something like non-human payrolls? I think a count of unemployed robots going forward may be far more useful. Just a thought! Yes! You can always dial up that portfolio risk in retirement. That magic always works. Further, there's no better time to be taking on more risk than when you don't have a job to fall back on. If you find that the dollar you saved is insufficient to meet your needs, then here's a way to dial up portfolio risk and seek 3,500% returns! Just pick your favorite number on the roulette wheel. I'll even share a secret with you to get you started. A legend tells François Blanc supposedly bargained with the devil to obtain the secrets of roulette. The legend is based on the fact that the sum of all the numbers on the roulette wheel (from 1 to 36) is 666, which is the "Number of the Beast". Can I believe that what I saw that night was real and not just fantasy? If one must take on more risk in this environment (especially with retirement savings), here's one contrarian tactic that might work though. I'm not trying to suggest that the markets are rigged though. Heavens no. This clearly isn't anything like the 1930s. Market Ticker: Buy This Guaranteed Loss! There are an estimated 622 million people living within China's urban areas. If Yi Xianrong is right, then the percentage of vacant apartments and houses within their urban areas to the population of their urban areas is therefore a whopping 10.4%. 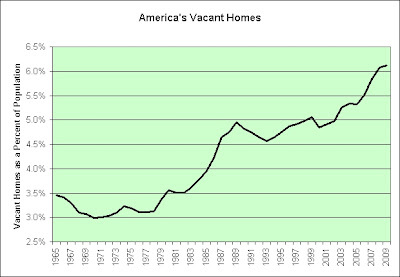 Here's a look at the percentage of vacant homes compared to the population in the United States. The chart clearly shows that China is yet again beating us at something. 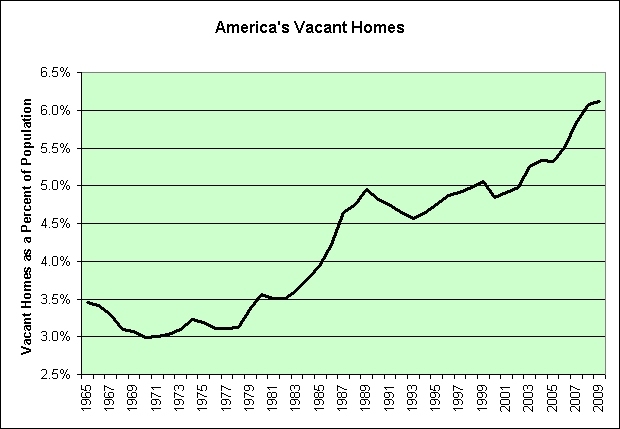 They are cranking out empty homes far faster than we are. It's an economic miracle! There's just no debating that. Well, there's just no debating that without using sarcasm anyway. You will note that the "incredible 33,000 empty lots and vacant houses" compared to Detroit's population is actually quite small. It's only about 3.7%. Detroit has been proactive at containing the damage clearly. Or should I say demolishing the damage? Detroit is finding it easier to tear down homes than to make property owners pay for the demolition. The city has sent invoices totaling more than $2.2 million to owners of abandoned homes razed as part of Mayor Dave Bing's massive demolition project. The total collected so far: $13,024. Way to go Detroit! That $13,024 goes a long ways in this new deflationary economy. We should not forget that it is worth at least 13,000 hours of moderately priced Chinese factory labor. Perhaps even more once China's high flying housing engine crashes and burns just like ours did. Who knows? The video was created in 2007 and we pretty much know what happened next. Here is a special request by "jus me" from the comments. As for the commentary, I think the chart speaks for itself. Further, I think it has a very disturbing thing to say. The party ended at 180% in 2006. As a side note, the salaries and wages data comes directly from the IRS and only includes those who filed an income tax return. 20.4% of all salaries and wages came from those earning less than $40,000. 55.8% of all filers fell into this group and they averaged just $17,658. Can you spot the potential real estate problem? 55.8%! 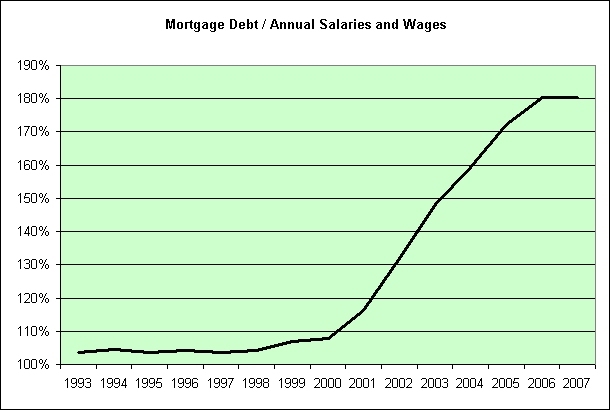 20.4% of all salaries and wages also came from those earning $200,000 or more. 3.2% of all filers fell into this group and they averaged $309,478. As you may know, the vast bulk of my nest egg sits in TIPS and I-Bonds. He's warning others that TIPS and TIP are expensive even though he owns both. It is refreshing to see that. That's pretty much exactly where I stand. Further, I hope he is right. I hope TIPS prices do fall. Here's something I wrote back in April on Yahoo's TIP message board. I have TIP in my IRA and I plan to keep it there for many, many years. So what should I wish the price of TIP to do? The easy answer would be that I would wish for the price to go up. Right? I want it to go down. It will hurt me in the short-term, but I'll more than make it up with higher real yields going forward. The worst possible thing would be for TIP to rise to the point that the real yields become 0%. From that point on all it would do is track inflation and it could never grow in real terms. Low real yields are not a saver's friend. I own individual TIPS and I hold them until maturity. I always want higher real yields (and lower prices). I never want lower real yields. I have some maturing next year and I'd like to be able to lock in a higher interest rate then. All I would get from rooting for lower real yields would be bragging rights and the ability to earn less interest in the future. I'll pass on that. If you are a long-term TIP investor and want to own TIP into the distant future, then cheer up. It might not feel like it, but today's drop in price was a good thing. If you are a short-term TIP investor then I can't really help you. You lost money today and no good came of it. Sorry. “Year after year, the story remains the same: neither the public nor the private sector has shown a tolerance for the pain associated with the type of forward action needed to address the U.S. pension problem,” Howard Silverblatt, S&P senior index analyst and author of the report, said in a news release. Year after year the story does remain the same. It's like we have debt and deficit monkeys on our backs. Go figure. OTTAWA -- Stock market volatility and dropping federal bond yields were bad news in the second quarter for holders of Canadian pension plans. Pensions can't make money with low bond yields any more than savers in general can? Who would have guessed? Big Pensions Eye Lower Return Forecasts. Should You? It’s no secret that public pensions across the country are seriously underfunded. What might not be so widely known is that many funds use an assumed rate of return of 8 percent. And based on what’s happening in California, that may be too optimistic. 8 percent returns may be too optimistic? It would only take 45 years to safely compound a total return of 8% at today's three month treasury bill yield (0.17%). It will just require some patience. That's all. What? Pension plans expect it to only take 1 year? And they also expect to repeat the miracle 44 more times? Wow! I want to live in THAT world! Anything seems possible!